Classic Film and TV Café: H.G. Wells vs. Jack the Ripper in "Time After Time"
H.G. 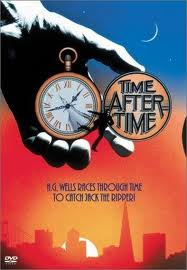 Wells vs. Jack the Ripper in "Time After Time"
This ingenious concoction of science fiction, thriller, and romance comes from the fertile imagination of Nicholas Meyer. A former publicity agent, Meyer first gained recognition with his best-selling mystery The Seven Per Cent Solution, which teamed up Sherlock Holmes with Dr. Sigmund Freud. After adapting his novel for the screen, Meyer served up a second pairing of real-life figures in Time After Time—only with a double twist. Instead of working together, the pair would be adversaries. And instead of setting the plot in the past, it would take place in the past and the present. Time After Time opens in fog-enshrouded London in 1893 with the murder of a prostitute by Jack the Ripper (shot in first-person, perhaps an homage to the opening scene in Mamoulian’s Dr. Jekyll and Mr. Hyde). The Ripper then appears at the home of H.G. Wells, who does not know that his friend Dr. John Leslie Stevenson is a serial killer. Stevenson joins the dinner party as Wells is explaining to other skeptical guests about his latest invention: a time machine. Malcolm McDowell as H.G. Wells. When a policeman tracking the Ripper shows up at Wells’ house, Stevenson’s bloody murder weapon is discovered in his physician’s bag. However, Stevenson has miraculously escaped from the house. It is only after the police have left that Wells realizes that Jack the Ripper has stolen his time machine and escaped into the future. David Warner as Jack the Ripper. McDowell and Steenburgen as time-challenged lovers. The film relies strongly on its three leads and they are all in peak form. 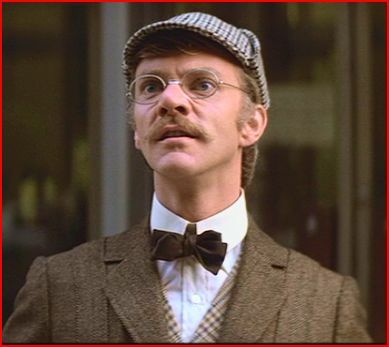 Malcolm McDowell gives one of his best performances as the wonder-filled Wells. David Warner exudes creepiness as Stevenson. And Mary Steenburgen comes across as both vulnerable and strong. She and McDowell have a wonderful chemistry together. They met on the set of Time After Time and married shortly afterwards (but subsequently divorced). Writer-director Nicholas Meyer went on to contribute to three of the best Star Trek films: The Wrath of Khan, The Voyage Home (another time travel picture),and The Undiscovered Country. Earlier in his career, he wrote two above-average made-for-TV movies: The Night That Panicked America (about Orson Welles' radio adaptation of The War of the Worlds) and Judge Dee and the Monastery Murders (an engrossing mystery featuring Robert van Gulik's seventh-century Chinese detective). Time After Time tops my list of the best time travel movies. It explores the usual time travel conumdrums with aplomb, but never lets them get in the way of a delightful love story and clever social satire. I like this film a lot. Time travel is always interesting. Warner is indeed creepy here. Glad to see you have Somewhere in Time on your favorites list. Jane Seymour is lovely. I love this film, and remember even reading the novelization when it first came out. What really set the tone for me when I first saw it was that it used the classic "Warner Bros." logo/music from the 1940's to open the film, which added to it's "timeless" appeal. I saw this movie with several friends when it came out. A neighbor of ours thought we'd like it and took us. He was correct. It still tops my list as of the best films of the 1970's. McDowell was great as Wells and David Warner was a perfect foil as the charming sociopath. I've sadly never seen this, though it's been recommended to me numerous times. I'm a fan of Malcolm McDowell (he's been on TV a lot lately), and your review makes this film sound immensely entertaining, so I definitely need to find this movie. Rick, your write-up is terrific and like a movie all its own! Thanks for a superb read. So nice to read comments from other fans of this marvelous movie! For those who have Comcast on-demand, I noticed that TIME AFTER TIME is currently available. Sark, I think this movie is right up your movie-watchin' alley. I love this movie! Right up at the top of the best time travel movies for me. Saw it in the theater when it originally came out and have never stopped loving it. The plot twists kept you on the edge of your seat, the performances were perfect. David Warner scared me no end when I was little and that movie made me wary of musical pocket watches... LOL! This movie is so quotable too. My whole family quotes lines from it regularly. Seven Percent Solution is also a very entertaining movie. I'm not sure I've seen any Nicholas Meyer films that weren't top notch! Thanks for a great review! I really enjoyed reading this. Rick, I have always had an avid interest in Jaack the Ripper books and movies, and this one is a favorite. I also love H.G. Wells Time Machine, so it makes sense that, along with the wonderful actors, this movie would be right up my alley. I agreee that when David Warner says "Now I'm an amateur" it was very chilling. I think my favorite Jack the Ripper movie is a British series starring Michael Caine, and of course George Pal's Time Machine was just marvelous. Really interesting article, Rick, witih some fascinating trivia! Rick , I ran into Malcolm for the second time while he was shooting this film. He would not talk about it, and if I remember right Mary was with him at the time. It was at a screening of If and O Lucky Man with Malcolm as host, at my "hang out" at the time the old Encore on Melrose across the street from Paramount. Those were the days, and I love this film , BTW Seven Percent Solution is Herb Ross film,based on Nicks novel. Great review, Rick. Thanks so much for reminding me to revisit this gem! I remember I got the video casset of this movie I was young in 1970's but that was really fun. I can say that movie made my intrest to jack the ripper series.